Project: Design of new site. 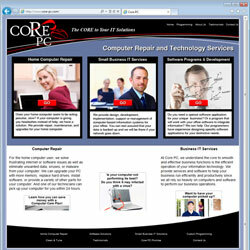 Project Scope: CORE PC, a division of CORE Programming Group, provides fast, reliable technical assistance and solutions for Hardware and Software to local business, small offices and home computer users. 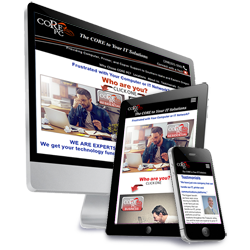 Responsive - Mobile Friendly: In July of 2017 we redesigned the site for it's third incarnation and also converted the site to be fully responsive (mobile friendly) for PC, tablets and cell phones and split the site into two web sites for the residential and the business services.